The white balance function on our digital cameras has allowed us to leave many of our filters at home. Instead of toting a warming filter, for example, we can now switch to the "cloudy" white balance setting. One filter, however, still needs to accompany us for our landscape photography: the polarizer. The polarizing filter helps reduce glare and saturate colors. It deepens the blue in skies and helps add punch to the clouds. The trick to reaping the most from this essential accessory is to have the sun coming from an angle, preferable over your right or left shoulder. Then look through the lens and rotate the filter until you have the desired effect. 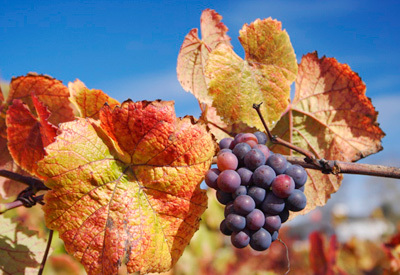 This shot of fall grapes was captured with a Canon Digital Rebel XT in Raw mode. I set the 18-55mm lens to 48mm. I made the exposure at 1/90 @ f-6.7.